(Newser) – A Vietnamese appeals court has upheld a blogger's 10-year prison sentence for Facebook posts alleged to be anti-state propaganda, her lawyer says. It was the second tough sentence imposed on dissidents in a week to draw a rebuke from the US government, the AP reports. 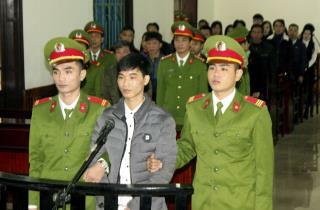 The blogger, Nguyen Ngoc Nhu Quynh, was convicted in June of spreading propaganda by distorting government policies and defaming the Communist regime. Lawyer Nguyen Ha Luan said the Supreme People's Court determined after a half-day hearing Thursday in the south-central province of Khanh Hoa that the conviction was justified. Quynh maintained she was innocent throughout the trial, Luan said, adding she admitted writing the articles, but saying they didn't constitute a crime. The popular 37-year-old blogger, known by her pen name Me Nam, or "Mother Mushroom," has written about human rights and the release of toxic chemicals by a Taiwanese-owned factory that killed thousands of fish in one of Vietnam's worst environmental disasters. US Charge d'Affaires Caryn McClelland said in a statement Thursday that she was "deeply troubled" by the court's decision. The US "calls on Vietnam to release Ms. Quynh and all prisoners of conscience immediately, and to allow all individuals in Vietnam to express their views freely and assemble peacefully without fear of retribution," she said. On Monday, a court sentenced activist Nguyen Van Hoa to seven years in prison after finding him guilty of producing online videos and interviews related to the fish kill. translation: Vietnam, China, NK Marxist Fascist Psychos stand tall; meanwhile we have a Marxist-Fascist-NWO-Military, corporation, Nazi Paperclip-Vatican-Malta in-your-face government, excluding our first American President since JFK, government of organized zombies with full control over mass media channels, including the net. We are ALL Mushroom People. This is the goal of "political correctness". Murdering and/or imprisoning everyone that dares to speak the truth about the evil of leftists. ".... to allow all individuals in Vietnam to express their views freely and assemble peacefully without fear of retribution," We can't even do this in the U.S.